Florida's coral reefs, already bleached by years of warming ocean waters, are being further battered by a mysterious disease. Erinn Muller is science director at the Mote Marine Lab in the Florida Keys. She says the lab's work to raise healthy corals is a "beacon of hope" for profoundly damaged reefs. In one raceway, Mandara says fragments of brain coral have grown quickly in this controlled environment. "The brain coral were eight fragments," he says. "And over time, they've grown out and have now fused into each other, becoming one coral that will hopefully over time become sexually mature." Mote lab's science director Erinn Muller calls such progress "our beacon of hope." Around the world, coral reefs are facing trouble. Coral bleaching, due in part to rising ocean temperatures, has stressed reefs, leaving them weakened and susceptible to disease. Now, in Florida, scientists are struggling to combat a mysterious disease that's threatening the future of the world's third largest coral reef. In just four years, the so-far unidentified disease has already had a dramatic impact on Florida's reef tract, which extends some 360 miles down the state's Atlantic coast. Muller says it appears to be a bacterial disease, and for about half of the state's species of coral it's deadly. "When they're affected by this, the tissue sloughs off the skeleton," she says. "And we see that once a coral is infected, it usually kills the entire coral, sometimes within weeks. And it doesn't seem to stop." William Precht was one of the first scientists to spot the outbreak and the impact it was having on corals. In 2014, he was hired by the state to monitor the health of reefs off the port of Miami, where a dredging project was underway. He saw the disease move from one patch of coral to another. Precht says it's proved especially deadly for species of brain and star coral, which form the foundation for many reefs. In some areas now, he says almost all of those corals are dead. "This is essentially equivalent to a local extinction, an ecological extirpation of these species locally," he says. "And when you go out and swim on the reefs of Miami-Dade County today, it would be a very rare chance encounter that you'd see some of these three or four species." Scientists believe ocean currents help spread the disease. Since it was first discovered, it's moved north, affecting reefs all the way up to the St. Lucie inlet. It's now moving south, through the Florida Keys. A large number of researchers are working to tackle the disease on many fronts. Some are using DNA analysis to try to identify the pathogens involved. Muller of Mote Marine says others are looking for ways to stop the disease from spreading. "Anything from... looking at chlorine-laced epoxy as an antiseptic, and even looking at how antibiotics interact with the disease," she says. "Because if it is bacterial, then antibiotics would be a way to stop it." This disease outbreak is the latest blow to a reef system that has been stressed and battered by decades of development, poor water quality and rising sea temperatures. After a long decline in Florida, coral reefs have been decimated, leaving too few species to successfully reproduce and rebuild the population on their own. That's why Muller believes the best hope now is to raise healthy corals in the lab and transplant them onto reefs. "We're really at a critical juncture right now, where we have corals left on the reef," she says. "Before we lose more corals, now is the time to start making a change." Mote Marine Lab hopes to plant 35,000 of its lab-raised corals onto reefs in the Keys this year. Muller says so far, corals raised in the lab have shown resistance to the mystery disease, giving scientists hope they may yet be able to save Florida's reefs. Coral reefs are in trouble around the world. Rising ocean temperatures and other problems have bleached corals, weakening the reefs. Scientists in Florida are struggling to fight a new threat, a mysterious disease that's affecting the world's third-largest coral reef. From Miami, NPR's Greg Allen reports. GREG ALLEN, BYLINE: At Mote Marine's Lab Center for Coral Reef Research in the Florida Keys, Joey Mandara is kind of like a babysitter. Instead of children, he tends to thousands of baby corals. They're in large, shallow tanks called raceways. JOEY MANDARA: So we have two of our older corals. We have mountainous star coral and knobby brain coral. ALLEN: He's proud of his charges. For several years now, Mote has been raising corals from embryos into adult colonies. In this raceway, Mandara placed plugs holding fragments of coral, which in this controlled environment have grown quickly. MANDARA: The brain coral were eight fragments. And over time they've grown out. And now they've fused into each other, becoming one coral that will hopefully over time become sexually mature. ALLEN: For five years now, Mote has been raising healthy corals like these and planting them on Florida's reefs. 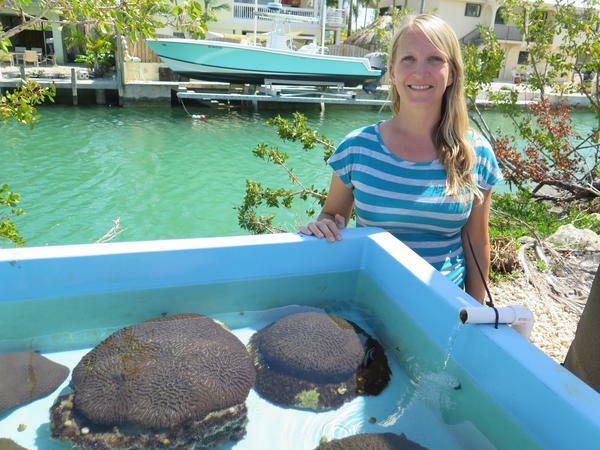 The science director at Mote's lab in the Keys, Erinn Muller, says the emergence of a new debilitating coral disease makes this work more important than ever. ERINN MULLER: It is our beacon of hope, as I call it. 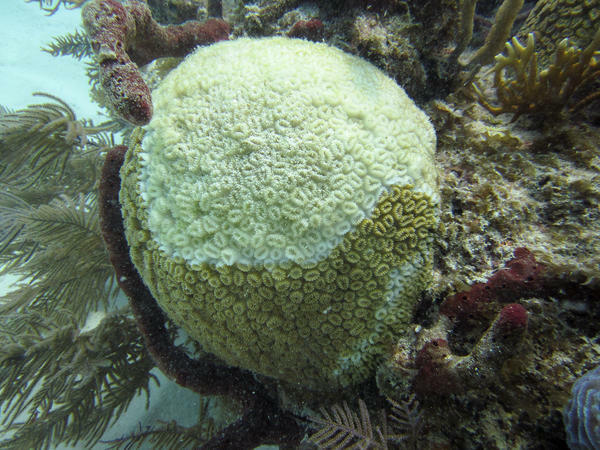 ALLEN: In just four years, a so-far unidentified disease has already had a dramatic impact on Florida's reef tract, which extends some 360 miles down the state's Atlantic coast. Muller says it appears to be a bacterial disease. And for about half of the state's species of coral, it's deadly. MULLER: When they're affected by this, the tissue sloughs off the skeleton. And we see that once a coral is infected, it usually kills the entire coral, sometimes within weeks. It doesn't seem to stop. ALLEN: William Precht was one of the first scientists to spot the outbreak and the impact it was having on corals. In 2014, he was hired by the state to monitor the health of reefs off the port of Miami, where a dredging project was underway. He saw the disease move from one patch of coral to another. Precht says it's proved especially deadly for species of brain and star coral, which form the foundation for many reefs. In some areas now, he says, almost all of those corals are dead. WILLIAM PRECHT: This is essentially equivalent to a local extinction, an ecological extirpation of these species locally. And when you go out and you swim on the reefs of Miami-Dade County today, it would be a very rare, chance encounter that you'd some of these three or four species, which is really catastrophic. ALLEN: Scientists believe ocean currents help spread the disease. Since it was first discovered, it's moved north, affecting reefs all the way up to the St. Lucie Inlet. And it's now moving south through the Florida Keys. A large group of researchers are working to tackle the disease on many fronts. Some are using DNA analysis to try to identify the pathogens involved. Muller of Mote Marine says others are looking for ways to stop the disease from spreading. MULLER: Anything from, like, looking at chlorine-laced epoxy as an antiseptic and even looking at how antibiotics interact with the disease. Because if it is bacterial, then antibiotics would be a way to stop it. ALLEN: This disease outbreak is the latest blow to a reef system that has been stressed and battered by decades of development, poor water quality and rising sea temperatures. After a long decline in Florida, coral reefs have been decimated, leaving too few species to successfully reproduce and rebuild the population on their own. That's why Muller believes the best hope now is to raise healthy corals in the lab and transplant them under reefs. MULLER: Before we lose more corals, now's the time to start making a change. ALLEN: Muller says, so far, corals raised in the lab have shown resistance to the disease, giving scientists hope they may yet be able to save Florida's reefs. Greg Allen, NPR News, Miami. (SOUNDBITE OF TIDUS' "GET IT RIGHT") Transcript provided by NPR, Copyright NPR.